UK July house prices rose 10.2% compared to one year ago, according to figures published by Halifax, continuing the upward trend in the annual rate. After falling in June compared to May, property prices in July increased by 1.4% on June. The Halifax emphasized that quarter-on-quarter comparisons are more reliable than monthly movements, which can be volatile. During the three-month period ending on July 31, house prices rose 3.6% compared to the previous three-month period (Feb-Apr). Since December 2013, there have been four monthly price falls and four increases. Although home sales have slipped by 6% since a recent peak in February, they are close to 103,000. Home sales volume was 21% greater during the April-to-June 2014 period than in April-to-June 2013. The number of enquiries coming from new buyers has been steadily declining since November 2013. 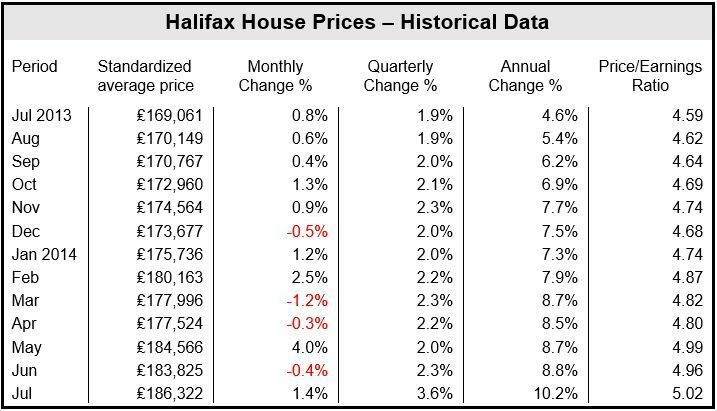 However, according to the latest Halifax Housing Market Confidence Tracker, sentiment towards selling is increasing. Fifty-seven percent of survey respondents think the next 12 months will be a good moment to sell, versus just 32% who think it will be a bad time. This is the highest positive score since records began in April 2011. Halifax is the largest provider of residential mortgages and savings accounts in the United Kingdom. It is a division of Bank of Scotland, which belongs to the Lloyds Banking Group. Halifax’ figures, which are based on its own mortgage-lending statistics, conflict with Nationwide’s, a rival lender, which sees a softening in the rate of house price increases. 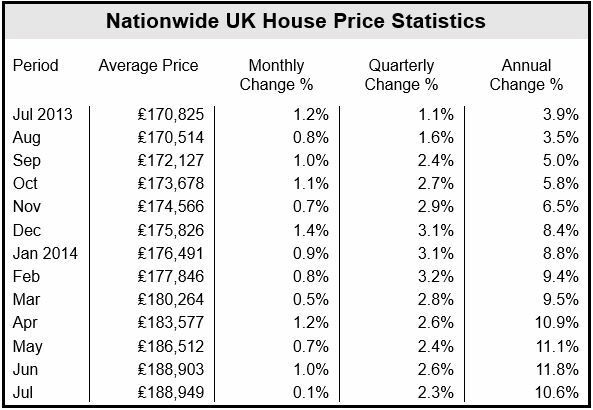 According to Nationwide, UK house prices rose by 11.8% (annually) in June and then by 10.6% in July. The Land Registry suggests that out of 10 regions in England and Wales, prices have fallen in seven.